Certain things in the world just shouldn’t be allowed to happen. We’re not best impressed with Saudi Arabia. Global warming makes us fear for our children, and/or Big Ben. When it comes to the refugee crisis, our heads want to explode with anger and confusion and sadness and guilt, all at the same time. 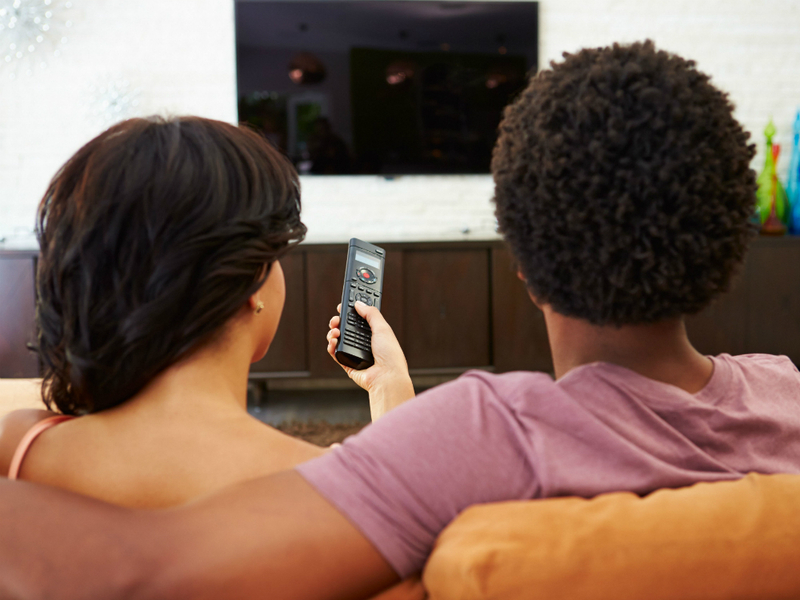 And we’re not obsessed with the idea of the new series of Game Of Thrones dropping at 2am on a Sunday night, either. * Meaning you’re either going to be really tired at work the next day, or calling your boss at 9am and explaining you’ve suddenly come down with a bout of food-poisoning-that-could-be-the-flu-or-maybe-even-chicken-pox. 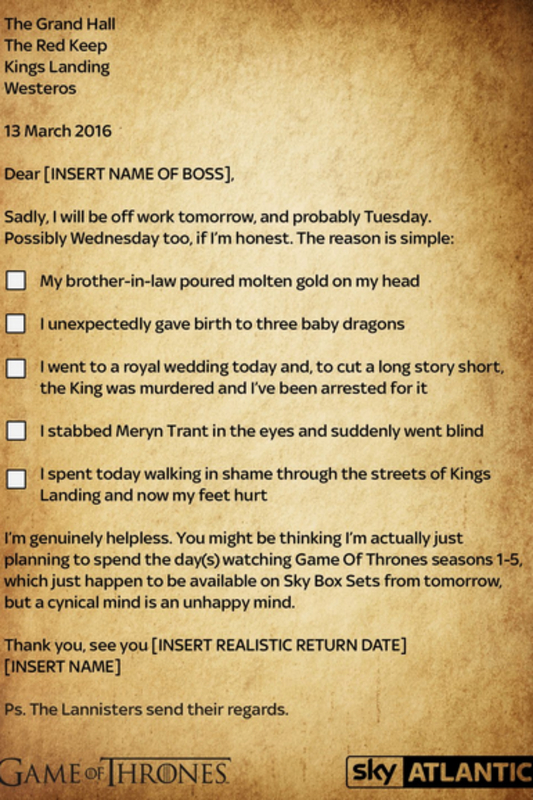 No surprise then, that Sky Atlantic, who have just released the first five series of GoT on Sky Box Sets, have released a letter for die-hard fans to submit to their employers – explaining their need for a day off to watch them all ahead of the new series. The excuses include: My brother-in-law poured molten gold on my head; I unexpectedly gave birth to three baby dragons; I went to a royal wedding today and to cut a long story short, the King was murdered and I’ve been arrested for it; I stabbed Meryn Trant in the eyes and suddenly went blind; I spent today walking in shame through the streets of King’s Landing and now my feet hurt. And, putting professionalism to one side for a moment, it’s a pretty good idea. – I accidentally ate the contents of two vending machines, and now I need to lie down. – I got lost in a maze made out of hay. – The maid over cooked dinner on Friday night, and my grandmother won’t let me leave the table until we’ve had all three courses. – I’m busy pretending to be a 17th century oil painting, and can’t move a muscle until Taylor gives me the sign. – I ran out of coffee. – There was a terrible accident on the tube this morning. – My husband and I accidentally smoked too much weed last night and I’m still whitied out. – I’m going through menopause but I don’t want to talk about it so I’m just going to stand next to the fridge for a while. – I’ve been taken on a hunting trip through the woods by a Republican. – [Delete as appropriate] My brother / mother / father / cousin / wife / uncle / girlfriend / assistant is trying to kill me. – [Delete as appropriate] I’m trying to kill my brother / mother / father / cousin / wife / uncle / girlfriend / assistant. – I’m busy forcing somebody in floral dungarees to sing a song about tequila. – I’m two thirds of the way through a rap battle and who knows when it will end. – I’ve got to make an appointment at the registry office to change my surname. – I’m hunting for some sun to stand in for a little while. – I have four years’ worth of white clothes to launder and some long-stem wine glasses to wash up. – My longest-serving team member has gone missing with an electric drill and I should probably try to find him. – The President is on the line. – I have some unresolved daddy issues and it would benefit us all if I could just attend a couple of therapy sessions. *Disclaimer – we’re very much aware that that the Game Of Thrones release date is not the same thing as the refugee crisis. But we’re capable of being annoyed by multiple things, all at the same time. Which is actually quite frustrating in itself.